Babies should not drink cow milk until at least 12 months of age, according to the American Academy of Pediatrics. Newborns given unaltered cow's milk can develop serious illnesses, including diarrhea, anemia and electrolyte imbalance. These consequences can cause permanent damage and may threaten the life of the newborn. Under no circumstances is cow milk an acceptable substitute for breast milk or commercially available infant formula. 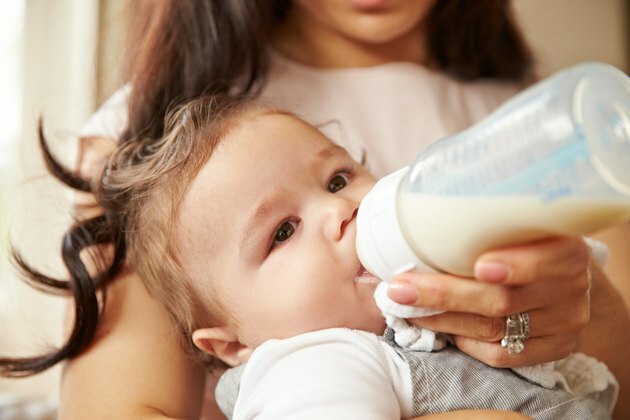 A 1992 report by the American Academy of Pediatrics Committee on Nutrition determined that babies drinking unprocessed cow milk suffer from significant deficiencies in iron, linoleic acid and vitamin E. Iron deficiency anemia is one of the most common and severe problems associated with cow milk consumption in newborns. Left untreated, this deficiency can lead to lifelong learning disabilities and delayed motor development. Although the AAP notes that newborns given iron supplements with cow milk may maintain normal iron levels, the organization notes that these do not "address the overall nutritional adequacy of the infant's diet." Newborns given cow milk receive excessive levels of some nutrients and minerals. The AAP notes that cow milk contains excessive levels of the electrolytes potassium and sodium, which regulate fluid intake. These can tax a newborn baby's developing kidneys and can cause serious illness when the baby loses fluid because of sweat or diarrhea. Cow milk also contains significantly more protein than human breast milk, and a newborn's developing digestive tract is unable to adequately derive sufficient nutritive value from it. The American Academy of Pediatrics notes that compounds in cow milk can irritate the lining of a baby's stomach and colon. This can lead to abdominal pain, as well as the loss of blood in the baby's stool. Over time, blood loss from digestive irritation can cause or worsen iron deficiency anemia. Certified lactation consultant Kelly Bonyata also notes a higher incidence of diarrhea and vomiting among babies drinking whole cow milk. Babies given cow milk early in life are more likely to develop milk allergies than infants fed breast milk or formula. According to Bonyata, cow milk's high protein content substantially increases the likelihood of an allergic reaction compared to infant formula, which contains fewer allergenic compounds. Allergies to cow milk may have long-term ramifications for the child's overall nutritional health, and in some circumstances, food allergies can be fatal. American Academy of Pediatrics: Why Formula Instead of Cow's Milk?